The brain has an astonishing capacity to adapt—it’s one of our key evolutionary advantages. A child can move from the plains of Africa to New York City and very quickly learn not only a new language, but also understand cultural cues and subtleties that are often unspoken. Adults, as we know, can have a tougher time because their brains are not as flexible (having already formed into the major neural patterns of adult life), but even so, research into neuroplasticity shows we have the capacity to change many aspects of ourselves at any age. As we adapt, the new environment becomes what, when we moved to Costa Rica eight years ago, we dubbed “the new normal.” Case in point (on a small scale): we bought land in a remote area near the Pacific Ocean, surrounded by fruit trees, monkeys, and exotic birds. It was amazing, wondrous, magical, and very different from our previous home in Minnesota. And we adapted. Our bodies adapted to the warmer weather, staying cool more easily in the hot days of January, and feeling a chill at 72 degrees during the rainy season. Our wonder at the howler monkeys changed to “when will they SHUT UP?” and when guests oohed and ahhed over this bird or that one, we nodded politely and said “Oh, yes, pretty.” Even the ocean palled after a bit. Going to the beach (only ten minutes away) was normal. Riding my horse was normal. Eating as many mangoes as I wanted was normal. Still fun (usually), but instead of an amazing adventure to be lived only in dreams, just the way it was. And what was amazing, fun and exciting was when I visited the U.S. and was able to shop at Target! Buy art supplies at Michael’s crafts! Drive on roads that weren’t full of potholes! Get in and out of the bank in under 10 minutes! Sleep in a house without bugs! 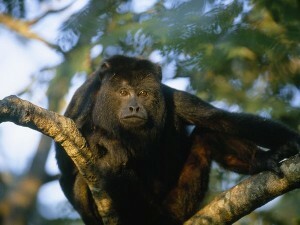 No howler monkeys at 5 am! TV! Internet! Any kind of food I wanted! WOW!!! And of course, that WOW lasted about 2 months when I moved back to Minnesota in 2009. Once again, I adapted. Aren’t we amazing creatures? But the reason I am bringing this up today is more important that mangoes versus shopping. As we grow and develop and expand our consciousness, different thoughts and behaviors become “the new normal” as well. And once something is the new normal, it may be difficult to understand how we could have ever been another way. (Which also can make it harder to understand how others can be where they are.) Think about how difficult it is to buy lightweight spring clothes when there is snow on the ground, or warm clothing when it is hot out. What is here feels – on some level – like it will last forever and like it has always been there. Of course we override this all the time, telling ourselves to be practical, so I don’t mean to imply that we are limited to our current experience. And still, our current “normal” has an impact. In our work teaching coaching, consciousness and neuroscience, we often have people reflect on where they have been on their journey of development. To use the language of the Seven Levels of Effectiveness, where have they shifted—really shifted—something from “below the line” to “above the line?” We’ve had hundreds of people do this over the years, and in our particular demographic have yet to encounter anyone who didn’t have an example. At least in the world of coaching and human development, it seems we all have made this shift in one or more areas of our lives. Why is this important? When we bring into awareness who we are becoming, where we have shifted our consciousness, we can own and integrate and stabilize the learning. Because of the “new normal” phenomenon, profound shifts to greater consciousness can simply seem like “so what?” unless we take the time to reflect and honor ourselves for the path we have walked. At this level, what used to be resonant (resonant = fun, rewarding, seductive, entertaining, interesting, compelling) to me? At this level, how do I feel now? What is now more resonant for me? Have fun exploring and let me know what you discover!